CTET Answer Key 2018 Paper 1 Set K – Get here CTET Official Answer Key 2018 Paper 1 Set K from this page. CBSE released official Central Teacher Eligibility Test (CTET) on December 28, 2018. It has been released through the login and to access it roll number and date of birth. The candidates can download and check the Answer Key for Paper 1 Set K and estimate their probable score. The result for CTET 2018 will be available for check for the candidates at least 6 weeks after the exam date. The candidates can check the complete details about the CTET Answer Key 2018 Paper 1 Set K from this page. 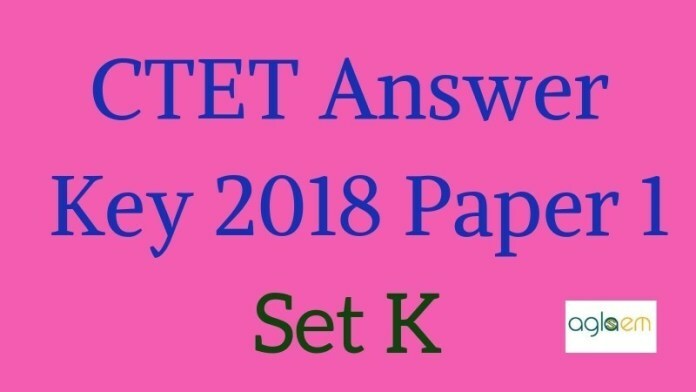 Latest: CTET Official Paper 1 Answer Key 2018 for Set K is available now. Along with official CTET answer key for Set K, the OMR has also been released. Candidates can submit challenges by paying Rs. 1000 per question. Last date to access the answer key is December 30, 2018. How to Download CTET 2018 Paper 1 Answer Key? Candidates who have appeared for the CTET 2018 exam can check below the process of downloading the unofficial answer key. The unofficial answer key has been released in the video format/PDF format. Candidates who want to download the answer key can check the steps below. As the answer key is available/ also available in the PDF format students can get the same following the below process. Click on the direct link above – The direct link for downloading the Answer key PDF is available above. Click on the same to get it. Check the Responses – As the PDF Opens, take a printout of it. As the answer key has released/ also been released in the video format, you can choose to watch the video above if you think it is easier for you. In the video, the students are guided by the correct responses of the CTET 2018 Paper 1 Set K. Students can play the video and listen carefully to get the answers to the question paper. Below the students can find the exam pattern for the CTET 2018 exam. To calculate the perfect scores in the CTET 2018 exam, the students can check the below-marking scheme. How to Calculate Marks through CTET 2018 Paper 1 Answer Key Set K? The candidates who want to check their probable scores in the CTET 2018 can check the below example. Example: Suppose a candidate had 120 correct answers (✓) and gave 30 wrong answers (✕). # is the marks for correct answers. Total Marks achieved by candidate = 120. The students can note that the answer key is an important aspect of the CTET 2018 or any other exam for that matter. However, it is very important for the students who have appeared for the CTET 2018. The Answer Key is a helpful source for the students who want to check their probable scores in the CTET 2018 exam. The students get the right satisfaction and help in clarification of queries and tension. Students can take the answer key and practice the question paper again. As the final answer key is released, students get even more satisfied as they get the exact scores in the CTET 2018 exam. The CTET 2018 result will be announced at least 6 weeks after the exam date. tAs the exam has been conducted on December 09, 2018, the students will get the result in the month of January end or February. However, any updates related to the CTET 2018 result will be updates below on this page. The candidate’s performance will be measured on the basis of the CTET 2018 result only. WHY ARE YOU PROVIDING WRONG ANSWERS?? ?